Rick’s battle plan is still being waged going into Episode 3. The fates of Eric and Morales are decided but there is a break in the ranks on how to handle The Saviors who surrender. 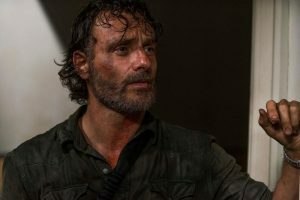 Mercy or Wrath is the moral quandary that The Walking Dead is wading knee deep into and while most viewers are probably saying “kill all those nasty Saviors!” a few of our heroes disagree. Though honorable, I fear there will be deadly repercussions to these mercies given. Who are the ‘monsters’? 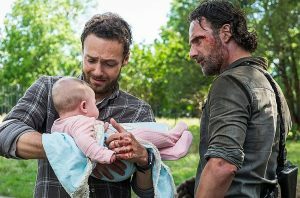 The Saviors? The Grimes Rebels? War makes monsters of both sides. As expected, Eric was mortally wounded. Aaron dragged off to a nearby tree and Eric urged him to get back to the fight. When Aaron returned he found only a bloody tree trunk and no Eric. In the distance, he could see Eric, now Walker Eric, ambling off toward a herd of walkers. Aaron wanted to go and put him down but it was too dangerous and he was pulled back by another Alexandrian. ‘That’s not Eric.” Nope. But still, hard to see your lover turn zombie just wander off into oblivion like that. Poor Aaron. My friends are already shipping him and Jesus. Too Soon! As expected, some of those saviors made a break for it when a pack of walkers rolled down a hill and into the group. Morgan went after them and started shooting them only to be stopped by Jesus. Well, Morgan wasn’t having it. Morgan and Jesus engaged in a terrific mana a mano battle royale with everyone watching. Jesus prevailed after taking Morgan’s staff away. But he tossed it back to him thinking Morgan had calmed down. He hadn’t. He plunged that staff right up to Jesus’ throat. I thought for a moment that he had killed Jesus! But he didn’t. He then admitted he ‘wasn’t right’ but didn’t mean he ‘wasn’t wrong’. Tara agreed with Morgan. 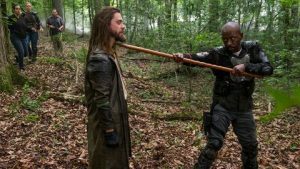 Morgan then wandered off, I assume to meditate and go on a walker killing spree to ‘clear’ his senses. 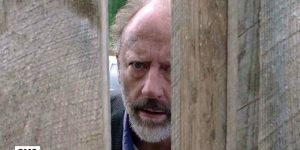 Gregory shows up at The Hilltop to find the gate locked and an angry Maggie refusing him entrance. She sees that he is driving Father Gabriel’s car and asks where he was. Of course, Gregory says he doesn’t know any Father Gabriel. Gregory is TWD’s only comic relief at this point so we suffer his presence. He pleads and begs and Maggie eventually lets him in. “He’s not worth killing….for now.” She tells Enid. Soon after, Jesus and Tara show up with the Savior prisoners. Gregory adamantly argues against letting them in. (Oh, the irony!) Maggie tells him to shut up but basically agrees that it’s too dangerous. Jesus talks her into to it though. They’re going to keep them in the two empty trailers in the back under 24/7 guard. You know, they’re going to escape somehow and kill many people. Mercy may be too big a price to pay for savior wrath. Rick and Morales have a short exchange at the opening of the episode. 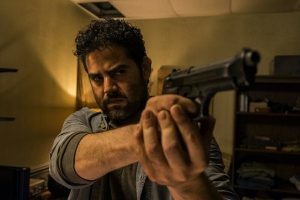 Morales, having lost his family was taken in by The Saviors and now he is a loyal follower of Negan. He tells Rick that they’re both the same, willing to kill for their people. Rick doesn’t want to believe that but before he can try to sway Morales to his cause, Daryl came along and shot an arrow through Morales’ face! Rick was shocked. Daryl didn’t care. The guy had a gun to his friend’s head. Later, after the battle at the compound had been won, a stray Savior took a shot at our Dynamic Duo. Rick reasons with him. If he told them what he knew, where the guns had been moved, he would let him go. He gave him his word. The guy came out and gave them the info and just like that! Daryl shoots him in the head! Rick, again, looks stunned! Daryl has no mercy to give. These two are going to come to a crossroads soon. Oh! The joyful and optimistic King Ezekiel is on a winning streak! 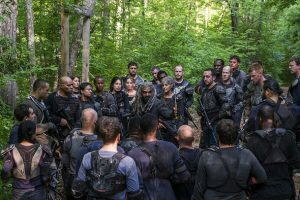 They spend the episode outwitting The Saviors left and right, fighting guerilla style all the way to their destination: Their designated Savior outpost. All is well! Not one of their rank had been lost! But all good things come to an end. Just as Carol ventures into the building for a looksee, Zeke senses something is wrong. An ambush! 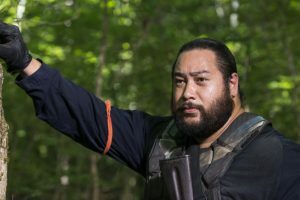 Machine gun fire rings out and many of King Ezekiel’s people are gunned down. A group of his followers rush to get in front of the King to shield him from harm and are killed. I assume King Ezekiel is unharmed beneath three or four of his ‘merry men’. Michonne is getting a nice long break from the action. Tara pointing her finger and pretending to shoot a Savior captive. Cold as ice. Next week will bring the demise of a major character. 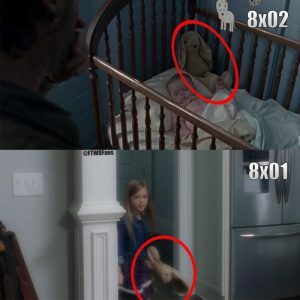 But not Judith, Father Gabriel or Gregory.